WHAT: Inspired by Michael Jackson's desire to heal the world, Major Love Prayer is a monthly global event, taking place at the same time all over the world, in every country on Earth. We all join together in spirit for a few moments to spread the positive energy of love, peace and healing to all. As MJ sings in Another Part of Me, "We're sending out a major love!" Visualize the thousands of others around the globe who are doing the exact same thing at this moment. This love now spreads out across the entire planet. Visualize it expanding further and gently encompassing Earth, going through all living forms, healing the animals, the forests, the air, the oceans, the people, everything. We are at peace. We are healed. We are love. We are one. Stay with this feeling for a minute or two, as long as you feel comfortable. You may continue for a few more minutes if you like. When you are ready to open your eyes again, be sure to thank everyone for this healing effort. In your mind and heart say "thank you" to your fellow fans and participants, to God/Universe/Creator and to Michael for the love and inspiration that brought us together today. Wish everyone well. Now open your eyes, take a deep breath and know that you are safe and centered within yourself. You are strong, healthy and loved. Excellent post...thanks for sharing this so that newbies can get an idea of what it's all about!! Thanks Saira. It's reworded some, based on feedback and suggestions in some prayer/intention books, but still doing the same thing in the end :) Whoo-hoo, only 9 days! I just want to say that in these instructions it says to start calming your mind and relaxing 5 minutes before the prayer starts. Last month (November), most people found that they really needed at least five minutes before the start just to get into the right mindset, to focus properly. Tomorrow will be my 1st time. Christmas Day (in America); how appropriate! Today is Christmas Day in Australia. 2pm New York time is about 7pm Sydney Australia time. I will be joining you all. God bless us all and may these prayers be answered with love, peace and healing. Merry Christmas to you all. Thank you for this. He's the 'white noise' in my mind always. How wonderful to be able to do this with so many others. It is Christmas in Australia today and I've said prayers for MJ again today and now to read about this is fantastic. I wish you all a very Merry Christmas and a joyful New Year. L.O.V.E. If you are living in Sydney then 9am/h is your prayer time for the reference time is Los Angeles time not New York time. You can verify this with the help of the time table on the homepage or even the counter on the upper right. Thank you so much for this wonderfull site. I wish you all the L.O.V.E. in the world in this Christmas day, 2010 and forever. We love you Michael Jackson! See you in heaven, my angel. this is for you Michael, we do it for love. This a a wonderful site. I hadn't known about this yesterday on the 25th but I did however say a prayer for Michael and his family, next month I will gladly participate. Thank you. Thank you Michael. This is by far the biggest and nicest thing I ever took part in. And today I felt like thanking all the people who made a translation of this to their languages. Thank you for all the time and effort it took to create this. Thank you for being so kind to want to change the world. We are Michaels students and can contribute so much to enhance this life on Earth. We just have to focus and just start it. This website is a great inspiration to me and I thank the makers of it very, very dearly. You are in my heart just like all the others who come together monthly to pray together for a better world. God bless the makers of this site i think it truly is so beautiful. Michael has and always will be such an inspiration to me. He is the reason why i am the caring, open minded, tolerent loving and giving person i strive to be everyday. I've been this way for so long that it is now automatic and i forget how i became this way but i always got remembered when i listened to Michael's song or if his name rised in conversation.When i was 9 years old and my dad bought me the HIStory DVD and i first watched Heal the world is when i learned the best lesson every learned in life. This is why his passing is so tremendous for me and for many many fans worldwide,i don't think this pain will ever heal, but i always remember that he is resting in peace and that angels don't belong in this world. thankyou so much, this brings tears to my eyes as I read it, they are indeed happy tears,yes i will do it and tell whoever will listen to do it too...thankyou.. I PRAY FOR HIM EVERY SINGLE DAY!AND EVERY NIGHT BEFORE SLEEPING I KISS HIM TO SAY TO YOU MY PERSONAL GOOD NIGHT!BUT I WILL DO ALSO THIS BIG PRAY FOR HIM AND FOR L.O.V.E.! I MISS HIM SO MUCH ..THE WORLD IS SO EMPTY WITHOUT HIM NEAR ALL OF US! !WHY ALL THIS!! !I CAN'T BELIEVE IT!!!! !I'M SO SAD..
FantFantastic!with all of myself into the heart and the univers of Michael:L.O.V.E. i really do miss michael jackson, he was a kind gentle soul of a angel. I would love to join. This is amazing. I will join you all and thousands of Michael's friends around the globe this coming Monday, 25 Jan. i will send you all L.O.V.E from Asia! ^ Wonderful :) Thanks all of you and L.O.V.E.! Thank you for create this website, I think we all are REALLY DESERVE to do in this way, when I read this instruciton above, I am feel REALLY INSPIRATION and we all are SO PROUD and SO HAPPY to be Michael Jackson's fan! I think this is a wonderful idea. "All together as one" I will let others know about this. We are doing this for you,Michael. We love you and we are with you !!! It's all for L.O.V.E ! wow! what an incredible idea! i can't wait until the entire map is loaded with connections, all a the same time ... we really are one, one in Michael, one in love. I will do this to help heal the world. I do it to honor Michael because I love him so much. What a wonderful example of L.O.V.E he is. I will do this to keep Michael's dream alive! Michael, I share your vision of love, peace, and healing. With great honor, I continue to carry your light of hope, and your message. You were the sparkle, you were the magic, and that for me, you will ALWAYS be! Thank you for this opportunity to connect with others seeking to heal the world. And thank you, Michael, for all you gave and continue to give to heal the world we live in. God's blessings upon us all. Can wait till next month!!! Thank you inviting me to pray with all Michael's fan. We Love you Michael and will alway be there for you.Heal the World!!! it was wonderful ... i've set the monthly date and time on my phone, with a reminder of 'man in the mirror' to call me to a major love prayer. L.O.V.E. & blessings to all of you!!!!!! Thank you so much for praying with us :) It's such a wonderful experience every time and I really believe it makes a difference. Even if we don't see the lions lie down beside the lambs tomorrow morning, it changes consciousness, it's making a difference on a whole other level (maybe a HUGE difference for all we know). Having thousands (maybe someday millions?) of people in every country of the world focusing on LOVE can only do good! Thank you Michael, our amazing angel, for inspiring us. We love you more! Although wake up at the early morning is hard for me, I got a very good experience! I can feel the feeling...thank you Michael, and all the people who joined this action, and this Web : ) thank you! Unfortunatly I missed the first one but now I know about this I'm excited to do it. I love this idea because ANYONE & EVERYONE can do it. I don't usually pray/meditate but I know I'm going to love the feeling of sharing this with all you MJ fans out there. I can't wait to do this. I can't wait too.. That will be my first time, because usualy I pray alone. So see you on 25 Feb. I am so glad to find this site and I am excited about participating this Thursday for the first time!! This is a great idea; thanks to those who started this up!! And as always, love you Michael! that's just Great!a very nice thing to do for this ANGEL!love u,Michael!!! !more and to beat that ...most!!!! For us Torontonians, our prayer/meditation will start @ 5pm, Thursday Feb 25, 2010. Remember we are "Healing the World" for our sake and our childrens' sakes. Let's do this for Michael, his Family and above all Prince, Paris and Blanket. It's All for Love....L.O.V.E!!! I'll pray with you guys tonight. 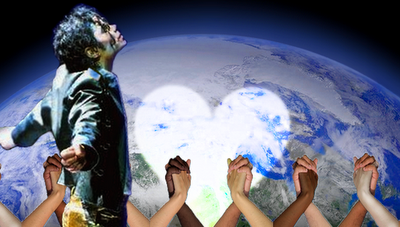 Heal The World, It needs us to do so. I sat on my bed with the window open listening to Heal the world and i prayed to Michale and told him we will spread his message of love...It felt sooo....Magical...like he was listenening. We L.O.V.E. you Michale and i hope you heard all of our prayers. thanx everyone , thanx michael! It was so amazing. i felt michael. it was like he was holding my hand and praying with me. I played heal the world, you are not alone and we are the world. it was an amazing experience. Love you michael and we will work together to heal the world for you. Thank you for all you've done. Love you Michael, help us all to heal the world ! Michael, my pretty angel, I miss you so much!... May God rest your soul in peace. I think this is a WONDERFUL idea and Michael would just love us so much more for even doing something like this. How and Where do I join? @ marlene, you simply participate. Follow the instructions on screen and concentrate on either praying to whatever God you believe in, thanking Michael or simply sending out all the loving thoughts you gave in you. This is so wonderful... I have been a fan of Michael all my life, and am so glad to find this. It's great to know that so many fans will be brought together this way. We love you, Michael!! This is a beautiful way to honor and remember the love of Michael he so much desired to express. With the love, l.o.v.e. I love these sites that focus on the love and beauty of the man that michael was, and not just michael the entertainer. he was to me more than an entertainer, i loved him for the heart and soul he possessed and the love he so freely shared. he was truly one of the rare people that God blessed and that he was willing and able to share the blessings bestowed upon him. i am not trying to take anything away from his talent, he most assuredly had that, but his gift was his heart. that is what i feel in love with, he was a person that i would have been truly honored to say he was my friend. we never met but i feel that in a way we were kindred spirits. all of the negative things that have ever been said about him, come simply from people who fear that in which they do not understand. most people can not fathom how a man of his talent and stature could have ever been so truly loving. while i always felt sad for michael having to live with the hateful stories told about him, i feel most sorry for those who told those stories, they are the ones who missed out on knowing that he was so much more than just a another way to sell another story, he was very Godlike, he said he knew he wasn't a God, but that he strived to be "Godlike" which is what we should all do. he just lived in a more spiritual plane than the majority of us. he gave of himself, not just money, but truly himself, his time was consumed with one thing or another, but always made a point to visit with those in need. we should take what he did and continue in his footsteps. May you continue to rest in peace sweet angel face. I feel so excited. I read about the meditation that occurs on another site on the 25th of each month, which is today, so I can't wait to join in tonight - tonight for me. I think it is a beautiful idea. May God be with Michael and his family, let us come together and pray for the planet and every living thing. Let us poor ourselves to the world with love, compassion and passion. for the king and his night are going to save the night. the sun will rise to a whole new world. The king with his children, the kinghts that will defend them, will rejoyce together, for new adventure will have began. You will dance and sing around your new King. For it's the beignning of the new adventure. So happy to know this is happening all over the world . I hope Michael can see us and feel the love and see how he changed the world to make it a better place for you and me. L.O.V.E. the sun is shinning, its a new day. Angel Eyes you are the one. We will follow you to the edge of the earth. out of the darkenss and into the light. The children will gather at your feet. Take thy child into your harms and carry them into the light. Sadly i kind of missed the prayer this month. I thought it was at 10pm (in the uk) but the times must of changed. I still prayed though :) I prayed for Michael to be safe and for him to know that we love him. I also prayed for world peace and for Michaels family to be healthy and ok. I love you Michael and i hope you can feel our love from heaven. I dont know whether to believe in the death hoax but i pray every night that you are alive. I realy do love you Michael. I know that one day we can all come toghether and create world peace. I see everything, my mind seems so crushed. Oh,Lord sent down an Angle. Fear as come over my heart. While I still believe I find myself fighting with myself. The emotions are left dingling for everyone to see. Got to stay strong, got to believe, got to have faith. But are we out of time? Oh Lord send some one now. that's what happens when you feel alone. but will it be strong enough to with stanthe up coming storm. Will love break through the night. well someone help me before the fear takes ove me? Or will I stand alone on the upcoming storm? I love the world, love the people, love every creature, will that be enough? Scared of my knowledge, scared for the people, what is a person to do? My mind is slowly going insane!! Can some out the help to fight for a great King told me through a dance. I sit in fear waiting for his command. My my heart tells me waiting isn't the answer. So I'll hold up the torch that will light a flame I hope the world can see it. I'll come out of hidding taking the first stand, hoping the world will see it. For fear runs through me as I will be alone taking the stand, hope the world will see it. love is the answer, Love is the way, hope the world will see it. Hope the commander will see it. Although I fear of taking the stand,I was taught by a great leader to take it anyway. "The people shouldn't fear of the government, the government should fear the people." That's what the teacher said. As I take a stand I will hang on to every song, every dance, and to every word and hope the world will see. And take the stand with The man that brought us out of darkness. I know he's out there somewhere watching and I hope the world is watching too.That we have to stand together and fight for what belongs to humanity. My wish is that Michael reads this, and I hope he knows I am doing this for him. Time for me to come out of hidding and take a stand of the upcoming storm. Hello family, happy Easter. Today I feel so alive, so free. CAN YOU FEEL IT? If not, just close your eyes and let your soul wonder into the bliss of light/ Let us unite together as one loving family. Untied we stand with the Grace of God on our side. Spread the word, spread God's message and unite. Love is everywhere today can you feel it? This is such an amazing thing to do! Thank you so much! I found this link just today and I have been wanting to do something like this for so long, this is a beautiful plan and I will try to be with you EVERY 25th! Thank you for creating this and for helping us all share the love! Let make bring you back to the light. Take my hand, and I'll be your guide, and walk with you under the stars tonight. for tonight is the night that they will not cry. Laugh of joy, dancing to the song, that's what the children do following along. Take my hand and hold oon tight for tonight is the night the world will see the love of one man and all his glory. I love you Michael and will fight to the end for you and with you. God is on our side don't you forget. All Michael fans from all around the world connected every month at the same time! I'LL BE THERE! Michael Jacksons fans are the best! Love is the answer that's what they say, sharing the love is a powerful and divine thing to do. Michael is part of that divine love and we are too. The seeds of love that is spread across the universe, our divine energy that will unfold on the earth and the truth of life with go on to the next with love of all. So be that seed and plant deep inside the earth and allow the energy flow across the universe. I want to thank you from the bottom of my heart for the beautiful work you are doing with this wonderful idea and page. It really is all for L.O.V.E. Michael is proud of you and I pray to God he too takes part in our Global Prayer. When we unite and LOVE unfolds! Thank you for allowing me to participate in the Major Love Prayer. A Beautiful Experience! 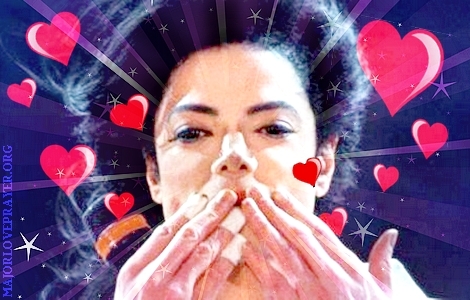 LOVE to all around the world, and especially to our dear Michael - HE did this!!! I'm sure that Michael would approve of this prayer unity every month on the 25th. He stood for peace and love for all! We all love him for this and will always remember him and the Jackson family in our prayers. I have just found this site I am so touched and I love what you have expressed and how you have described Michael for all is true and wonderful I will from now on be part of the world in prayer I will join you on the 25th and pray in silence knowing that through the power of love and Jesus it will one day heal the world and honor Michael's Memory whom I love with all my heart. May God bless you all around the world and I will be with you in a few days. I just done the prayer for the 3rd time. This is the only actual time i felt that i wasnt alone. I prayed for all the poor and ill people in the world. And i told Michael that we will heal the world for him because we owe that to him. He has given us so much and we need to repay him. I promise i will truy my hardest to heal the world. I just found this site, as one of my fans posted a link on my FB fan page, "A Million Trees For Michael". I love your message and think we must have been separated at birth because what you are writing sounds exactly like what I write every day on my site! If you haven't heard of "A Million Trees For Michael" please check out the FB page of the same name or go to www.AMillionTreesForMichael.com and check it out. I posted two notes about your site so our fans could join in the Major Love Prayer today and I joined in, as well. Are you familiar with the Global Coherence Initiative? If not, go to http://www.glcoherence.org/, as they, too, have us pray for specific needs in the world. It's a pleasure meeting you and I look forward to being your friend! Today, I will be handling all your problems. Please remember that you need my help. If you face a situation that you can not handle, do not try to solve it. I ask you, to puy your problem in my hands. Once you've placed your problem, leave it there, forget about it. make sure you make the right decision. lose your sleep because of your concerns. Rest in Me, I'm your father. If you want to contact me, I stand at the distance of a sentence. Also, consider this: Be happy with what you have. If you find yourself stuck in traffic, do not despair. There are people in this world for those who only drive, it is a privilege. they do not know what love is, and those who have never been loved. in paraplegics with great pleasure that would want to take your place, and walk that distance. kemo therapy, which would like to have your hair. You have faced a terrible loss, and ask yourself: What is the purpose of this test? Be thankful, Be thankful you had the privilege of knowing it and love it. You are in a moment of your life, because you are object of bitterness, ignorance, criticism or envy of the people. Remember, things could be worse, you could be one of them! You feel as you would not help. someone else, he is also my son. If you feel you do not have anyone. Remember that your father is sending you this letter, and I will always listen to you. I will never forget you, I hope you will remember me. With all my love for my son that I love so much. This prayer is one of the gifts God has given us. Let us continue praying for one another, and all for peace in the world. I am so glad I found this and wish I had found it sooner. I will be joining June 25th. I cant believe it has been a whole year :'( I feel unbelievable pain. I wish he was here. I Prayed for the world and all the ill people. I prayed for Michaels family and for the worlds children. Ive been crying so much that my eyes wouldnt cry. I want to heal the world for you Michael... Thank you for everything you have done. iF I could switch places Michael and let you live, i would. You mean the whole entire world to me. I promise that i will try my hardest to heal the world Michael. I am so thankful for my friend who told me about this site,it is beautiful.The writing in here is just out of this world.Such touching words.It would have made Michael very happy to see the love that is poured into it.I pray that we all listen to what we are saying and spread love & kindness in this world like he did. I feel so at peace with myself. I prayed that all the ill children of the world be saved and that all evil will disappear. I cant believe it has been 1 year 1 month since that horrible day in june. But i believe that Michael wouldnt want us to mourn. I think he would want us to carry on his legacy and heal the world for him. Michaels message of love should be bursting out of everybody in this world. Everybody deserves to have at least 1 person to love and to care for them. Michael, i miss you so much. But i realize that you are at peace and in a better place. Michael, you have made me realize how much i love this world and how much i want to heal it and make it a better place for future generations. Michael, your music and legacy will live on forever and i know that future generations will listen to your music and love it. I love you Michael with all my heart and i will always love you untill the day i die. You have the other side of my heart. I wish i could trade places with you. I would trade my life so that you could live. I love you from the bottom of my heart. I made it this time. God is good. I love you so much Michael!!! Wish you could come back. The time between June 25, 2010 and now has been very trying for all of us. But God is good. I pray that this prayer will bring more than people together in the spirit of what Michael lived for, but in the spirit of love for each other as we strive for a common ends to a means today. We are met on a battle ground where conspirators and co conspirators are conniving to steal our joy. But we cannot be moved. we cannot be detained. We cannot be detoured. When God leads, no one can change our course. The path is clear though perils be in our way. With dignity and steadfastness, we will do what is in His plan. And by and by, those who try to discourage us will one day stand with us because goodness always prevails. I believe in His time all things are possible. God is good. This 25th let's pray for my father too pls pls!! !a healing prayer.Thank you all! !Our mother Earth needs us to heal her with our L.O.V.E. Our intent of LOVE and healing is very POWERFUL:we need to KEEP THE FAITH! !Keep believing!And remember:WE ARE NEVER ALONE!! @gabriela: I will pray for your father, too. I will pray for everyone who is sick this time. And will do so even earlier. All the best to your father. I pray all happens according to your wishes in God will. Hello dear family,army of LOVE,yesterday i bumped into something that disturbed me,made me SAD..SAD..SAD and dear ones,we have to STOP IT! !TOGETHER we can do it! !NOW is the time to be all ONE-the mother EARTH @these precious&lovely beings need us!! what is going on with this world?????OMG... :( :( :( killing dolphins just for fun? :::|:|:|:|:|:|:|:| this is sick:( :( my heart is bleeding.. This happen every year on the Faröer islands ( Denmark ). The most „important” participants are teenagers !!!! Why ? Is a kind of „holiday”, to demonstrate their „maturity”.Everybody participates in one way or another, either slaughtering them, or just watching. The Calderon dolphins – as many other species – are in extinction. Their come in close encounter of people, to play and to Communicate. They don’t die immediately. The humanoids hurt them with hooks, once, twice, or more.At that moment, the dolphins make a sound like a newborn baby. These awesome beings struggle, but they are not „comforted” meanwhile they die in their own blood. Check this video out -- Calderon dolphins http://t.co/rwvty6R via @youtube we HAVE TO STOP THIS!!!! !here and NOW!!!!! PLS let's do something!! !let's save them! !they need us! !need our help,our love,our DIVINE HEALING LIGHT b/c we are LOVE,we are DIVINE LIGHT! !WE CAN MAKE A CHANGE!! !LET"S BE THE CHANGE! !Let's do it !! !Our dear Michael LOVED dolphins too remember his poem"Enough for today?" LET"S collect signatures around the worls and send the petition to the government,USA,U.E-i have in my mail almost 850 signatures from many countries! !let's unite and let's do it dear ones! !let's try and save the dolphins and put a stop to this atrocity!!! !we can do it!! !LET's start making the CHANGE Michael wanted us to do,to BE!!! Dear family! !army of LOVE! !now is the time for us to unite,be ONE and help,SAVE these precious lovely beings! !Mother EARTH needs us NOW! !we need to collect signatures from all around the world as many as we can and send the petiton to the government,USA and U.E. and stop this!! !we can do it !! !let's be that CHANGE! !let's do it dear ones!!pls! !what is going on with this world?????OMG... :( :( :( killing dolphins just for fun? :::|:|:|:|:|:|:|:| this is sick:( :( my heart is bleeding.In Denmark is still allowed this atrocity. For the moment, the ocean’s water had colored to red ... But not from natural causes. ..:(But because some humans slaughter the Calderon dolphins, famous by their intelligence. :(:|:|This happen every year on the Faröer islands ( Denmark ). The most „important” participants are teenagers ! Gabriela(gabriela_st81@yahoo.com-in my mail 850signatures from people around the world)we need to collect more and more and make the petition alive! !let's do it! !let's make that change!! !Let's make Michael proud!! I am in tars! Hearing Michael´s Gone too soon. Thank you all for this amazing, divine, lovely time we share together each 25th. Michael brings us together as the best Bridge of Light. @Sandra - that was beautiful, thanks! People, are U sick?? This is crazy! Prayin'? With other fans? Ok, I respect, but U should all understand one thing - MICHAEL JACKSON HAS NEVER BEEN A GOD! Michael is no God, there is only One. I think it`s wonderfull! !LOVE Gerda, from NL. This is wonderfully idea. There power in prayer. I'm looking forward in praying for the world with other who seek peace around the world on December the 25th. Especially the fact this is Prince of Peace birthday Jesus Christ my lord and savior. God Bless all. Nice to know that, Kim. It´s really nice to pray together. Michael is sureley proud of us! I got the url to this site 30 minutes agao and looking forward to pray with you all together! Thanks that this site exists! Welcome, Chris! So glad you've joined us! Hi, everyone. We are together again connected with Michael in LOVE. unbelievable. Love you all. This is amazing, will be joining tonight..Michae will without a doubt be feeling and recieving our undying love..we love you MJ! I'm sooo joining this! !Gosh I wish I knew about this sooner!! Welcome! We're so glad you're here! :) We do this every month since autumn of 2009 and have every intention of keeping it going forever! Please help us spread the word to your forums and friends if you can, too. It just helps get the word out so that everyone knows about this! Betelgeuse - and "Michael's Circle of Love"
I love you Michael and I love your kids like my own kids! I pray and think about you and them each day of my life... I hope you can find the peace you couldnt find in this planet and I hope you have REAL justice soon because you really deserve it!!!! I adore, love and miss you so much, dear #MichaelJackson !!! Thanks for all you gave us and for your care for our planet!!!! Thank you Michael Jackson for your love, your example and showing us how to love in practice. God bless you and all the fans who wok to promote your legacy of love. MY DEARS, MICHAEL"S FAMILY, THIS MONTH WILL BE 7 YEARS WITHOUT MICHAEL ON EARTH. PLEASE LET ALL DO SOMETHING SPECIAL FOR HIM, IN EVERY COUNTRY,IN EVERY CITY OF THE WORLD LET WEAR T-SHIRT WITH MICHAEL, BAND ON OUR ARMS, HAT AND GLOVE! LET SING AND DANCE, LET MICHAEL SEE US FROM HEAVEN THAT PLANET EARTH REMEMBER AND CELEBRATE HIM AND ALL THE PRECIOUS LOVE THAT HE SHARED AND STILL SHARE WITH US! THIS IS THE LOVE THAT WILL TRAVEL OVER THE CENTURY WITH US AND WILL GROW MORE AND MORE! GOD BLESS YOU ALL FOR ALL TIMES! LOVE YOU MICHAEL!